The Respondus LockDown Browser is a customized browser that increases the security of quiz delivery in Learn@UW-Stout. When students use the Respondus LockDown Browser to access a quiz, they are unable to print, copy, go to another URL, or access other applications. Once a quiz is started, students are locked into it until it's submitted for grading. 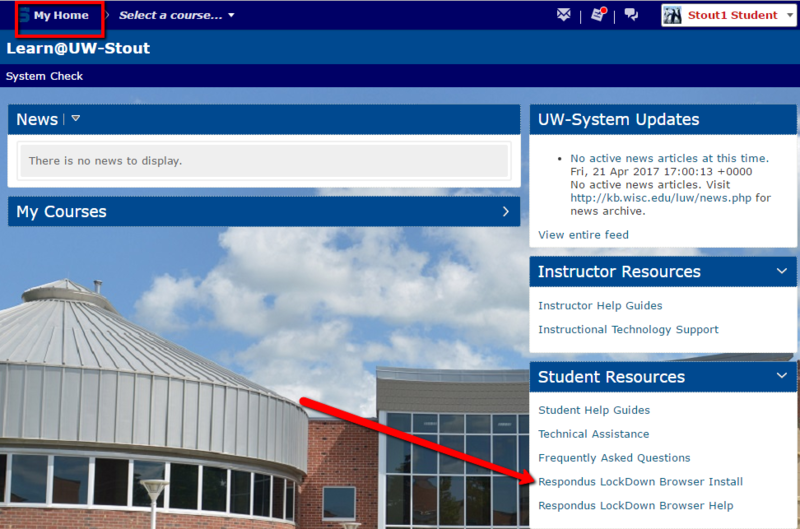 To install Respondus LockDown Browser go to the "My Home" screen on the Learn@UW-Stout homepage. Click the Respondus LockDown Browser Install from the "Student Resources" widget. Follow the instructions as prompted. Open the quiz/exam that requires Respondus Lockdown Browser. Click the link to Download and install the latest version of LockDown Browser. Locate the "Launch Lockdown Browser" button on the quiz/exam start page. Respondus LockDown Browser will prompt you to allow the application to make changes. Click Yes. Once a quiz has been started with Respondus LockDown Browser, you cannot exit until the Submit Quiz button is clicked.